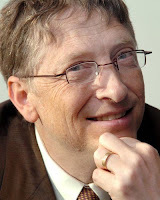 Steamy Fantasy: Bill Gates = Mr. Wickham! Bill Gates = Mr. Wickham! I was repairing my computer at home and Microsoft Office gave me the headache of my life. I sometimes get very annoyed that these software giants put out new versions every year with a slight difference and make the good old honest versions I spent thousands of dollars to buy useless in no time. Who is your villain lately? I agree that it's frustrating when things get constantly updated or changed. And have you noticed that the new versions are usually not as good as the old? We have an old fridge in the garage that's umpteen years old and running fine even though stuck out in the heat. Yet our brand new fridge (about a year and a half old) has already had repairmen out and its computer replaced four times. Grr. Ha! You still crack me up even when you're mad! Stay away from the Chamber of Commerce as they are family-oriented. But there are plenty of other events you can look into. Where I live, there are countless youth events such as surfing contests, concerts, and such that your book would be accepted and bought. Big or small, there are many events where you could find people to sell your book. I'll look into more options and get back to you. Poor Marvin, I give you a flying hug now. So far, I still like google. Stephen, I know I can be mean but I've only killed Wickham a few times, haha, and thanks for the idea. Helen, it's universally true that new appliances break down when the waranties expire. Old machines were built for life. Ha, Alexis, I don't know I've some funny bones in me until I started writing.